Aron's got it! With three marathons finished this year, and another (the CIM) coming up on Sunday, she's ready to finish off a great 2009. She ran over 2000 miles, crossed off five of her six goals for the year (and Sunday she's determined to cross that last one off the list), and has inspired so many runners with her amazing talent and fun blog. Did you know that she decided to run a marathon in January 2008 and has completed FIVE since that goal?? Awesome! Right now its the lower calf stretch. Hands on the wall in front of you, one leg back like the normal calf stretch, but you bend your knee to get the low part. Always having a goal to achieve. I am a very goal oriented person, so I like to have goals that I am trying to reach. It can be weekly mileage, a marathon time, or a specific pace for a run that day, it helps me get out the door. I started running in February 2008. I signed up with a group to train for the San Francisco Marathon and pretty much started from scratch. I worked out a lot, but wasn't really into running. 6 months later I was a marathoner! "Listen to your body", "just run", and "you will never regret going for a run"
My best runs are when I don't think about anything at all. When I do think, I do a lot of math (calculating routes, etc), I think about blogging a lot too, and just what is going on in my life. Sadly my garmin, I am a numbers addict and need to know. I love marathons, but I really love half marathons. You can run fast, don't have as long to recover, and are still a great accomplishment. But I do love the feeling after completing a marathon! Aron: Here's to a Boston Qualifying 3:40:59 (or less) finish at the CIM this weekend! Rock it, girl! love it girl :) THANK YOU for the spotlight!!!! Great spotlight. It's an interesting series you have going on here, and gives us all some great insight on other runners. Off to check out Aron's blog out now. That's a great story about the proposal. Good luck this weekend, Aron! 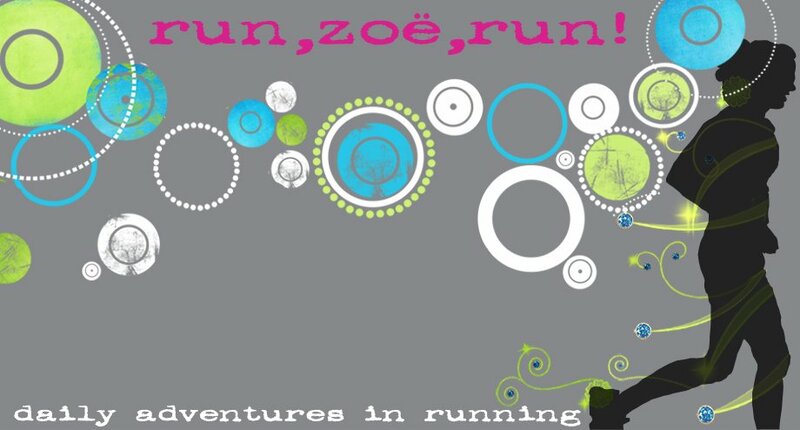 As always, Zoe, I love these runner profiles! Keep 'em coming! Aron's good people. She'll rock CIM as long as she remembers to have fun while doing so. Awesome timing on this.. I am so going to be STALKING Aron to see how she does at CIM.. We are FB friends so that will make it easier..
Asics Gel Kayano. Awesome! Thanks for sharing Zoe. keep it up!